I love using what I have to make something from nothing, don’t you? This was a super easy craft project. Oh and did I mention it was FREE? Just turn on some tunes and start cutting! 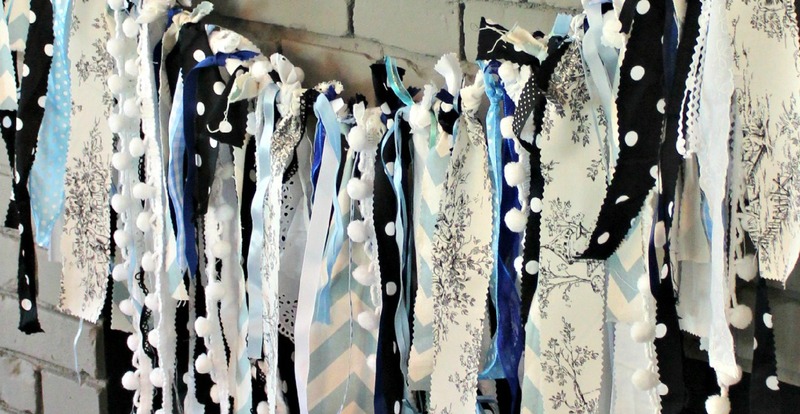 To make it, I just used about 6 feet of twine to affix the fabric and ribbon to. Then I just pulled out my tub o’ fabric scraps and fabric bolts and selected a pile that I thought would coordinate well together. I cut the fabric into about 12″ by 2-3″ strips using pinking shears. As you can see, some are longer, some are shorter. Then I just started tying each of the fabric strips onto the twine evenly about every 6 inches, just eyeballing it to spread each strip out. To fill in the space between the fabric, I pulled out a bag of scrap ribbon and whatever fabric spools I had on hand. Then just tie the ribbon onto the twine. Just keep tying on ribbon until it looks full and festive. 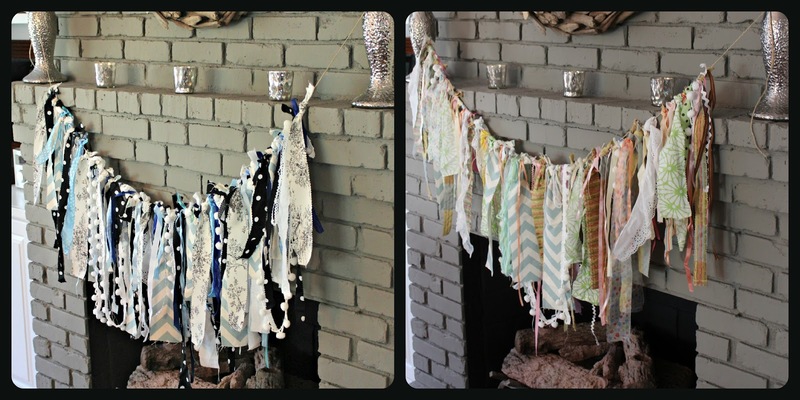 Since one baby shower was for a little girl and one was for a little boy, I actually made several Fabric Garland Darling-Garlands in different colors. Harvest-Darling-Garland? I see burlap in your future! I am certainly pulling out the girl version for this year’s Easter decor. Wouldn’t one of these would be darling in a nursery as well? 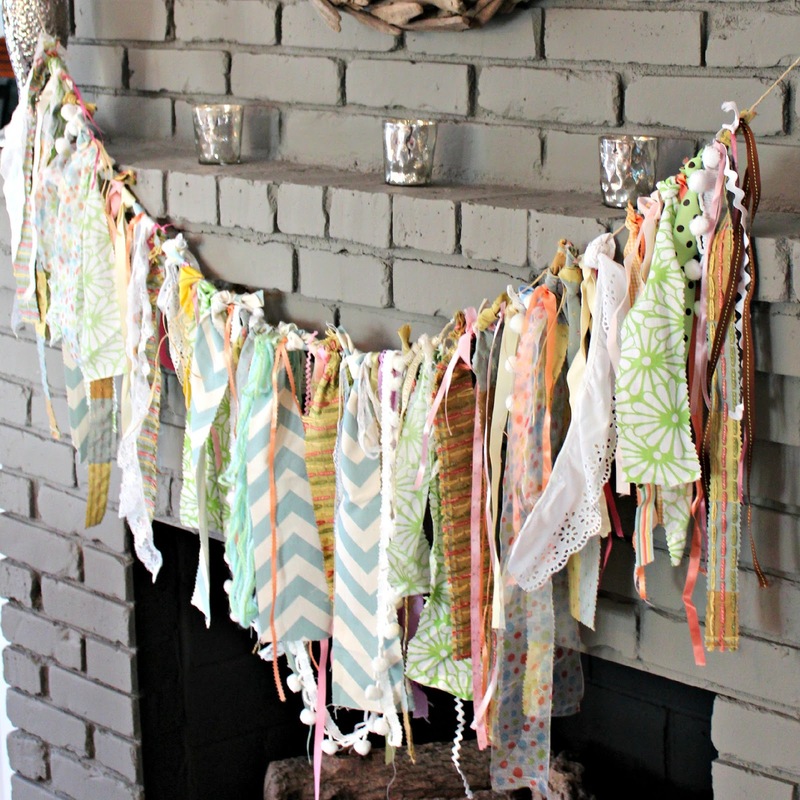 This is a great way to put all of that fabric and ribbon you have been hoarding hanging onto to good use! Here’s to using what you have to make something new!